Woman Narrates How Her Hubby Slept, Impregnated And Married Her Niece. 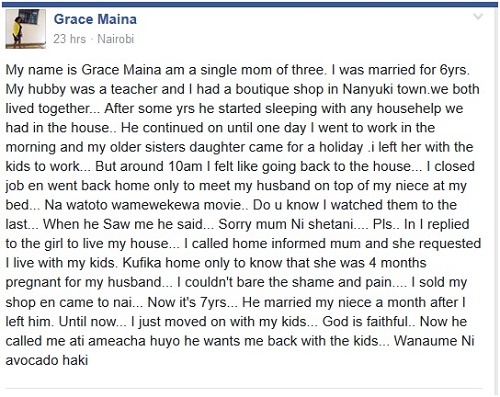 In a post shraed by The Kenya Post, a woman, Grace Maina from Nanyuki narrated how she was left devastated after her she caught her randy husband of six years on top of hr neice. Grace narrated the story on her Facebook account, to rub salt on injury, the niece got pregnant and he married her. » Woman Narrates How Her Hubby Slept, Impregnated And Married Her Niece.